May 8 – of running and deep thoughts and dinner – Trees & Flowers & Birds! Ah well – work was brightened by the news that Adam Lambert’s 2nd album which releases in the US in a week was streaming on his website. I listened to it twice and chair danced the whole time 🙂 Oh how that voice makes me smile. So – the deep thoughts – well first it was following the efforts today in North Carolina where a pretty odious Amendment was unfortunately voted into place to define marriage in their state constitution as the only type of legal domestic partnership the state will recognize – and of course they limited marriage to only being between one man and one woman. So they effectively did away with ANY type of non-marriage relationship having any legal definition or rights recognized. It eats away at adoption rights and even domestic abuse laws outside of a marriage. Makes me so sad. The rights of a minority should NEVER be voted on my the majority. Also? I really really loathe discrimination and labeling people as “less than” or “other”. OTOH I was thrilled to hear that San Diego will be the first city in the nation to have a street named after Harvey Milk! That will happen sometime this month for a street in Hillcrest. You can bet I’ll head up there to take a picture when it is dedicated! So I was going to mention that a co-worker in another department has a really cute sticker on her car that I first noticed yesterday. It’s a little girl kneeling in from of a cross and it says “God answers knee-mail” Hah! Cute huh? Knee mail. Love it. I’d like to chalk this up to the gals youth. But I hope she learns someday that it isn’t necessary to challenge other people on their beliefs like that. I know a lot of Christians who feel like they can’t express their faith in the open – but – like that? The knee mail sticker? Fabulous. The t-shirt? Borderline. The question about the t-shirt? Crossed the line IMHO. 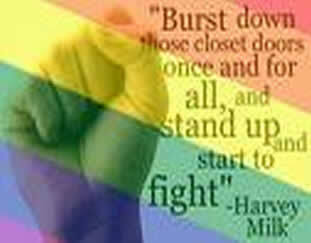 This day must, of course, be rainbow in honor of Equality. Which will happen in my lifetime! It must! May 7th – It was Monday, that is all.